The Co-op Refinery Complex (CRC) in Regina, SK, continues to grow and change in part because of its relentless pursuit of quality and productivity. 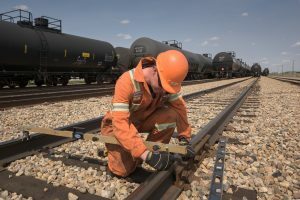 One of Canada’s largest refineries, CRC contracted Cando Rail Services to provide an integrated rail services solution including construction of a railcar staging facility, switching inbound and outbound railcars, track inspection and maintenance, and mobile transloading services, all crucial to the refinery’s business. Cando and CRC had been in regular discussions looking for an opportunity to partner in the development of an integrated rail service solution at the Regina refinery. Cando and CRC’s first commercial relationship began with Cando’s Winnipeg-based Central Manitoba Railway subsidiary, transloading diesel and gasoline during the winter of 2011-12. In fall 2012, CRC finished a $2.8 billion expansion that increased the overall refinery output by 40,000 barrels of gasoline and diesel a day, which served as the catalyst for discussions between CRC and Cando. The goal was to improve the refinery’s rail service by increasing efficiency and reducing demurrage costs, and taking advantage of the additional refinery output. In 2013, CRC contracted Cando to build a dedicated railcar staging facility and have Cando perform all switching, track maintenance, and inspections at CRC. Cando switched its first car for CRC in September 2013, with the Victoria Plains facility coming online in late December 2014. Craig Kezama, a Petroleum Distribution Services Manager for Co-op at the CRC, was responsible for sourcing Cando for these jobs. Over the past decade, Cando has evolved into one of the largest railcar staging service providers in Canada, with currently more than 5,700, spaces either owned, leased, brokered or otherwise controlled and operated by Cando. Cando began moving that direction in 2008, when the company recognized that industry was having a hard time finding affordable railcar staging and storage solutions as the global recession hit. In 2009, Bob Feeney, Cando Rail Services’ Director of Business Development, based in Edmonton, saw an opportunity to help companies struggling to store their railcars by offering to build and finance custom facilities specifically designed and located for their particular needs. Cando’s first railcar staging yard was constructed in Edmonton, for a client in the energy industry. 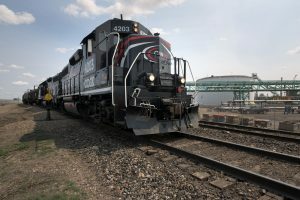 Cando helps its customers gain efficiencies by building integrated service solutions including staging yards, and on-demand 24-hour switching services that have their railcars available when they want them. Integrated solutions can also reduce the need for additional capital expenditures by allowing our customers to turn their loading/unloading infrastructure more often. Critical to securing this project were Cando’s demonstrated safety performance, and ability to obtain running rights on CN track, and Cando’s experience to develop properties to support our Rail Services operations. Located just two miles from the refinery, the Victoria Plains yard has space to store up to 255 railcars and is immediately adjacent to three CN tracks used to interchange traffic between CN and the refinery. “The benefit of having a dedicated facility is improved inventory control and increased efficiency within the yard,” says Feeney. When Cando has an opportunity like this to build a solution from start to service, efficiency and accessibility are part of the blueprint from day one. About 20 Cando team members, including two supervisors, work at the Regina operation. There are two Cando locomotives at CRC to ensure loads are switched in time for CN or Canadian Pacific (CP) to hook and haul them away. Based on Kezama’s feedback, it sounds like this philosophy makes a difference. With the increase in annual railcar movements at the refinery, CRC has been able to manage costs and gain efficiencies by having Cando’s switching and staging services integrated with the refinery loadout operations. Darren Barabonoff, Operations Manager for Cando at CRC, shares that because his team handles all the rail services for CRC, Cando is able to plan ahead and deliver near-perfect service. For example, he explains that when the refinery requires track maintenance, Cando is able to coordinate switching to minimize the impact to railcar loading. “Good integration allows us to plan in advance and minimize disruptions,” says Barabonoff. Service six days a week ensures the CRC never runs out of empty railcars to load. In designing the integrated rail solution, Cando included the staging facility and supporting switching services so cars would always available whenever they are needed, day or night. Working with the Class 1 railways was crucial when planning CRC’s staging facility and switching services. CN has tracks running through the middle of the refinery, and Victoria Plains is accessed through a running rights agreement between CN, CRC, and Cando. Cando created a partnership with CN as part of the building process at Regina’s Victoria Plains yard that included both a land lease, as well the running rights. This was possible due to a long-standing working relationship with the Class One’s and Cando’s track record of service. “We added considerable value to CRC through collaboration with CN,” says Lee Jebb, Cando’s Vice President. Cando has running rights on CN and CP track at a number of locations and daily interchanges into major switching yards across Canada. Cando holds a federal Railway Operating Certificate (as a local railway), and meets all the legal and regulatory requirements (railway insurance, training, equipment, procedures and Safety Management System) necessary to operate as a rail services provider on federal, provincial and industry tracks, something few companies can offer. Cando bridges the gap between the Class 1’s and the customer, and communicates with CN or CP on a regular basis to ensure excellent service. Cando is one of Canada’s leading rail service providers to the energy industry, with the expertise and experience to design or build rail terminals, fuel transfer systems or transload facilities from scratch. Cando’s crews will continue to work as a part of the customer’s local team ensuring continuous improvement, excellent service and around the clock support. Read more about how Cando services the energy industry by reading our Parkland Fuel Corporation case study.